I bought a new TV stand for my TV cause my old one was literally disintegrating. The TV wasn't the only thing on my old TV stand and so I had to do some spring cleaning and throw out anything useless which is usually a long process for me cause everything will then become debatable whether it constitutes use or not. One of the last few items I found while cleaning out the remainder of the stuff was an old padlock. 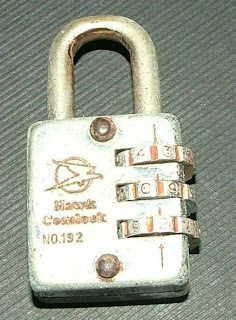 I clearly remember this used to be my college padlock donated by one of my 15 other friends who shared the same small cramped locker. Well I forgot the combination, and I forgot which 15 other friends I shared the locker with. And I guess posting it on our college mailing list asking for the combination would make me a laughing stock. I remember a scene in the movie "An Officer and a Gentleman" with the commander stressing to his squad that an unlocked padlock is a useless padlock because the essence of a padlock is to hold something locked. Hence, an open padlock hanging on some box or container is the same thing as an open box/container. So a locked padlock is serving it's purpose in life. I agree. I also agree that a locked padlock locking nothing but air is also useless because it is not locking anything. Furthermore, a locked padlock with a combination unknown to anyone is useless cause chances of it being opened are nada. And so I reach my the verdict. This padlock is USELESS. In memory of the padlock, here is its last photo before joining my trashcan on June 2, 2008. May you find more adventure wherever you may end up. Sweetie! The poor padlock. You threw it out. Sana we framed it, memento rin yan hehehe.